[C] [(R)] Shinken Hissatsu: During your turn, if you have a Grade 4 or higher Vanguard, this gains +2000 Power. 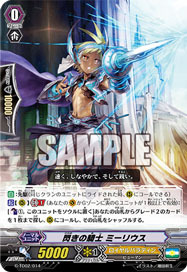 [C] [(V)]: When you pay for the cost of Stride, if you're Striding a G Unit with "Taroutachi" in name, cards in your hand gain +2 Grade. Now, Jirou-san will go berserk, mkay?